After timber removal and survey work, the tubing park grading work has begun this week. 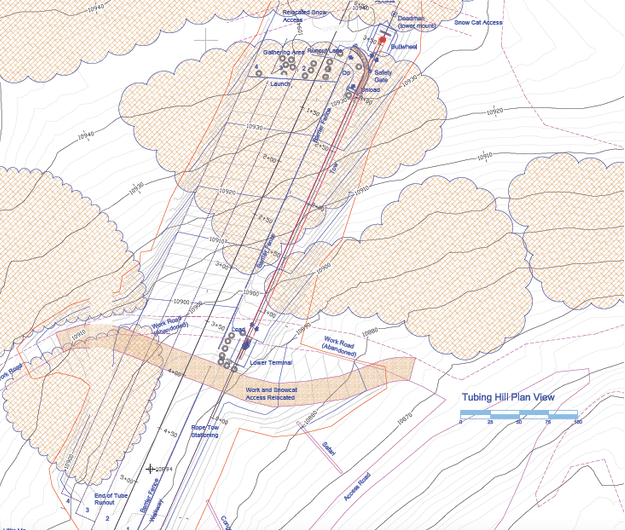 The engineered plans involve tubing lanes designed to be slightly tiered (from lookers left to lookers right as seen in the image above) in the upper portion of the tracks. The lanes will then flatten out and become more consistent in elevation down in the runout zone. This will assist in decelerating riders as they come to the bottom of the tubing lane and make exiting the lanes easier. The bottom of our summer access road will be slightly relocated to allow the bottom lift terminal to be installed. The rope tow lift must be placed in this location so that the angle of the cable may remain consistent from the load to the unload area. Unlike an aerial lift that can more easily handle abrupt changes in terrain, there are no intermediate towers to deal with changes in topography so, the cable must be placed along a consistent grade from top to bottom. Each tubing lane will be graded to be approximately the width of a snowcat. During the winter, we will utilize an implement behind one of our snowcats that with each pass of the machine can transform these wider lanes into two narrower lanes. One or two lanes will remain wider to allow groups or families to ride down individually in clusters of 2, 3 or 4 tubes at once.